Yatala is fast becoming another big job generating centre for our City. As I have said many times before, certainty and confidence attracts investment, investment creates jobs, puts downward pressure on crime and keeps families together and food on the table. Certainty and confidence seems to be in abundance at Yatala at the moment! Its not until you see it from the air can you hope to comprehend what is happening in the north of our City. Yep, infrastructure has to keep up, especially our road work, so that's why Deputy Mayor Donna Gates (and divisional Councillor for the Yatala area) and I are upgrading the roads to ensure the B-double and A-double (big rig) trucks can get in and out. It’s crucial that the State and Federal pollys keep pushing for and funding the upgrades to the on ramps and off ramps for the State Government's M1 entries/exits all the way to the boarder. And a second M1/IRTC (M2?) has to be on the planning horizon as well. This clip from Channel Seven State Wide News tells the stroy pretty well. I trust it will trigger some big industrial firms to take a second look at Yatala - as there is no other place in Australia with such good access to the National Highway network, three international airports so close (Gold Coast, Toowomomba and Brisbane), Port of Brisbane just up the road and on the doorstep of "Australia's Lifestyle Capital", making recruitment and retention of top staff a snap for any business based here! Stand the test of time at Sovereign Estate, with stylish family homes in the thriving Northern Corridor. 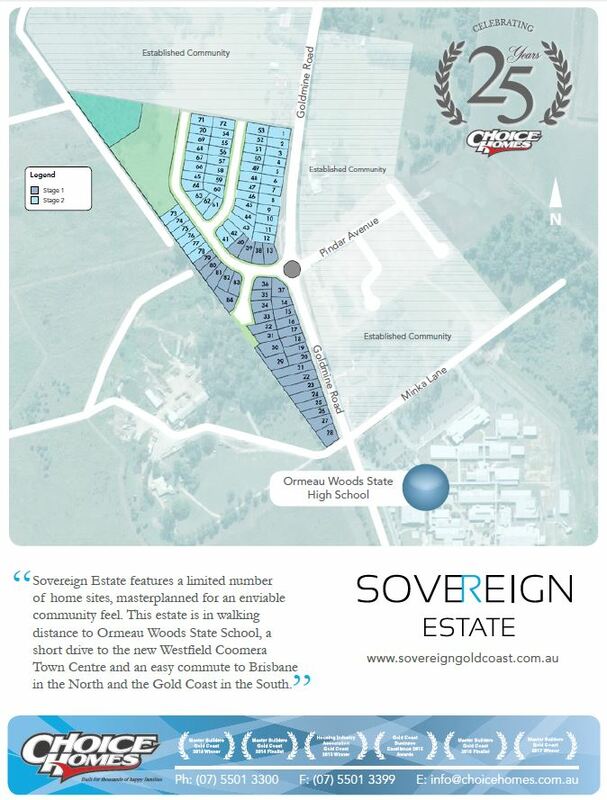 Sovereign Estate features a limited number of home sites, masterplanned for an enviable community feel. This estate is in walking distance to Ormeau Woods State School, a short drive to the new Westfield CoomeraTown Centre and an easy commute to Brisbane in the North and the Gold Coast in the South.